Vince Keenan, my mystical master in all matters movie-wise, recently mentioned on his blog a soon-to-released boxed set of DVDs that is simply said, a must-not-miss. Available on March 20th is a boxed set of four Michael Shayne films from the forties that I have not seen in a long, long time, if ever. 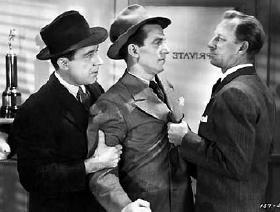 All four of them star Lloyd Nolan, whom you�d never go too far wrong by casting him as a semi-down-on-his heels private eye, but as Vince says, the perfect fellow would have been Ken Tobey. The Man Who Wouldn�t Die. 1942. Credit is given to the Brett Halliday characters, but the novel it�s based on was Clayton Rawson�s No Coffin for the Corpse, a classic Great Merlini “locked room” mystery. Having never seen this film, and I’m very eager to, I don’t know how much of the plot line has been preserved, but for what it’s worth, way down in the IMBD credits is Charles Irwin as “Gus, the Great Merlini” (uncredited). Sleepers West. 1941. This one�s based on Frederick Nebel�s mystery novel, Sleepers East. I don�t know. You tell me. Blue, White and Perfect. 1942. Credit for the characters was once again given to Brett Halliday, but the story the movie’s based on was actually written by Borden Chase. 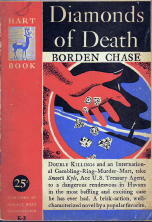 It didn’t appear in book form until it came out as a 1947 digest paperback entitled Diamonds of Death (Hart K-2). The first appearance of the story was probably as a serial in one of the pulp fiction magazines in the 1930s. 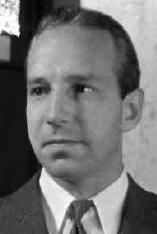 Here�s a picture of Mike Shayne that was used on the covers of tons of 1950s Dell paperbacks. I�m not sure, but I suspect that the artist responsible was Robert Stanley. I’m sorry that it’s rather small, but it was only used in the corner of the covers. Maybe he needs a hat and a cigarette drooping out of his lip, but I don’t see a resemblance. He isn’t bad, but it’s tough to tell, since all we see in this photo is his profile, but if you think about the Beaver’s show, and think Mike Shayne, do you get the same disconnect that I do? Do you know what? As the years went on, I think the producers and the casting personnel were getting closer. 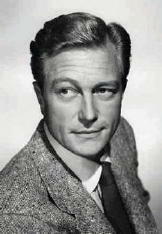 Vince said Kenneth Tobey was the man, though, and I’m in full agreement. What do you think? [UPDATE] 03-19-07. A few typos have been corrected in the essay above, and several questions of a bibliographic nature have been answered, requiring a bit of revising here and there. This is now (um) the current version. Thanks again to Vince Keenan for allowing me to play on his ground. I saw Hugh Beaumont as Mike Shayne in the movies when I was a kid and liked him in that roll. Later when I saw him as the Beaver’s dad I couldn’t buy into it. “Like who’ed a thunk it.” Vaughn Dennis a real old guy.